Planning for home to Med cycle ride…. – Do your dream! 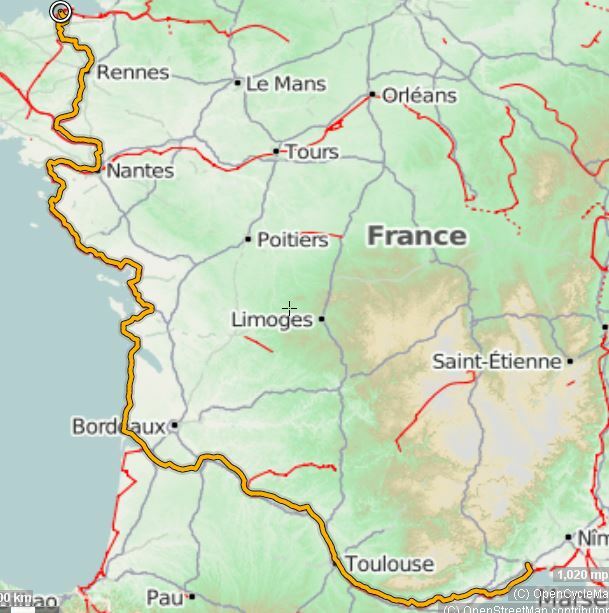 Well, we’ve committed to cycle from home to the south of France for some sunny beach time! Its only 700 miles or so, so can’t be that tough – surely? But considering we normally just load up and take the ‘van this trip will require quite a bit of planning and surprisingly quite a lot of expense! Our bikes are quite good but are mountain bikes, and not really tourers, but then we’re not really cyclists, so I’m sure they will be fine with some modifications and kit! The start is a bit awkward, but drops you onto the V42 velo vert route, down to Redon where you pick up the EV (European Velo) EV1 which goes just south od Bordeaux, and then cutting across forest cycle routes to the Canals, and Canal de Midi (V80) which with other routes drops into Montpellier. Of course, it would be helpful to access the route remotely. So, I’m using Android phones, so using OSMAnd which is free (but limited) – but the free version is fine for this entire route. It only allows you to download 10 areas, and that is enough. With this installed, download the maps off line, upload the GPX route, then the entire map is available with all open street map POIs! It really is fantastic! (You can find nearest campsite, toilet, bike shop etc – all very good indeed). Works, but a pain – so if you want them here is the Archies Camping and ACSI database is OSF format for you. But, bottom line, everything from detailed map, POIs and detailed route all available offline on our mobile phones! The only downside, is the route is 843 miles! That’s without detours to/from pubs/campsites etc and getting lost, so it’ll end up being a 900+ mile trip – and maybe even 1000 miles!!!! Oh. We expected 600-650 ish! Oh well – committed now…. How hard can it be?! Well here is a list of the new equipment we’ve had to buy…. Pannier bags. Again, having had cheap bags before, we bought these Altura dryline bags which are large enough (we hope!) but also fully waterproof. They clip onto the racks and don’t foul anything and just fit perfectly. Quick-release clips should mean a hassle free system! Camping stove. After taking advice, we opted for a new spirit stove (with pans etc) – rather than gas, as white-spirit/meths is available anywhere and no need to worry about finding a niche supplier of proprietary gas canisters. Lightweight and functional, and with a kettle! Bike tyres. Of course, our bikes are mountain bikes with knobbly tyres which would be fairly hard work on the road, so we changed to these Schwalbe Marathon Supreme tyres which will make the journey a lot easier as well as being Kevlar lined to minimise punctures. Tent. We are hoping to take a new Vango Halo 200 which we’ve not bought yet. It seems the best size/weight combination with areas to store the pannier bags in the dry. Sleeping Bag: We have lightweight trekking bags, but for this trip wanted something more comfortable, and so we wanted a 2 season double sleeping bag. Sadly, most were 3.5-4kg or more which is quite an increase. Outwell released their Campion double in March 2014, perfect timing, so we bought one of these which is around 2.5kg which is reasonable enough weight and compact enough to be a good choice. Tech: I will need to have some sort of “remote access” tool, so we are taking the Nexus 7 with an amazing Bluetooth keyboard and USB mouse connected via an OTG cable. This gives laptop-esque functionality, and with remote access tools like TeamViewer, I should be okay…. Of course, the Nexus 7 will have all the maps and route on as well. We will also have our smartphones (MotoG & Nexus 4) for GPS and mapping. Along with a new pump, that’s the bikes sorted out…. Well, as we won’t be fit when we start, and the journey is basically cycling North coast to the South coast of France, then we’re going to cheat and cycle to the train station and get the train from Trowbridge to Portsmouth! Then an overnight crossing from Portsmouth to St Malo on Brittany Ferries – and then cycle from St Malo… This works quite well in terms of timing as well. On the return we’re going to take the bus – more specifically European Bike Express from Montpellier direct back to London, probably Potters Bar, where we can then get the train back to Chippenham and cycle home. Again, timings look pretty good.